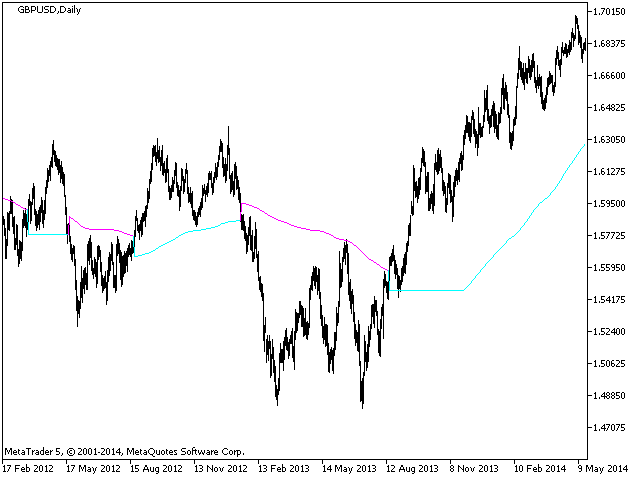 This indicator identifies market regimes based on a moving average channel of the highs and lows. When the system is in the bull regime, it only allows the channel to increase, and vice versa in bear. The reason for choosing a channel over just a moving average is to get the benefits of hysteresis and reduce whipsaws by using a range of values before switching from bull to bear regime. Hysteresis is a natural phenomenon that appears in magnetism, elastics, cell mitosis and control theory (e.g. thermostats). These systems exhibit path dependence in which the current state depends on the path taken to achieve it. The system has memory and the effects of the current input are only felt after a delay or range threshold is exceeded. Many people believe that markets also need time to respond to new information and that response does take into consideration recent market history. This market regime filter requires price to close below the low of the channel before switching into a bear regime. When price is above indicator value the market is bullish and you should look for opportunities to go long. When price is below indicator value the market is bearish and you should look for opportunities to sell short. Hysteresis is primarily meant to be used as a trend filter in combination with another strategy or indicator. You can for example use the Value Chart indicator in conjunction with the Hysteresis indicator. When Hysteresis indicates that the market is bullish, look only for long entries and use the Value Chart to identify temporary pullbacks to rejoin the trend, and vice versa for a bearish market.